Over in India the Android faithful now have a couple of new low cost Android ICS smartphone to consider in the form of the A21 Android, and the A9+ Android handsets, with the A21 being a dual SIM smartphone that have now been announced by Karbonn Mobiles and can now be purchase online if desired. The Karbonn A21 is a dual SIM GSM+GSM handset with one SIM supporting 2G and the other supporting 3G, and a report over on Techtree has it that the A21 sports a 4.5-inch qHD 480 x 800 pixel touch screen along with a 5 megapixel auto-focus rear facing camera with LED flash, a 1.3 megapixel front facing camera, and powered by a 1.2GHz Snapdragon dual core processor. The Karbonn A21 Android is an Android Ice Cream Sandwich smartphone that offers 802.11b/g/n WiFi, Bluetooth, the usual Google services, 4GB internal memory, microSD expansion up to 32GB, GPS, and a 1800mAh battery that is said to offer up to 5-hours talk time and up to 8-days standby time. The Karbonn A9+ Android handset is again an Android Ice Cream Sandwich smartphone that sports a 3.8-inch WVGA 480 x 800 pixel touch screen along with a 5 megapixel rear facing auto-focus camera with LED flash, a 1.3 megapixel front facing snapper, 802.11b/g/n WiFi, Bluetooth, a 1.2GHz dual core processor, 4GB internal memory, microSD expansion up to 32GB, and a 1420mAh battery said to offer up to 4-hours talk time and up to 8-days standby time. As for pricing, the Kardonn A21 can be purchased by hitting up the Karbonn Mobiles website where the device is available in Pearl White and commands a price tag of RS. 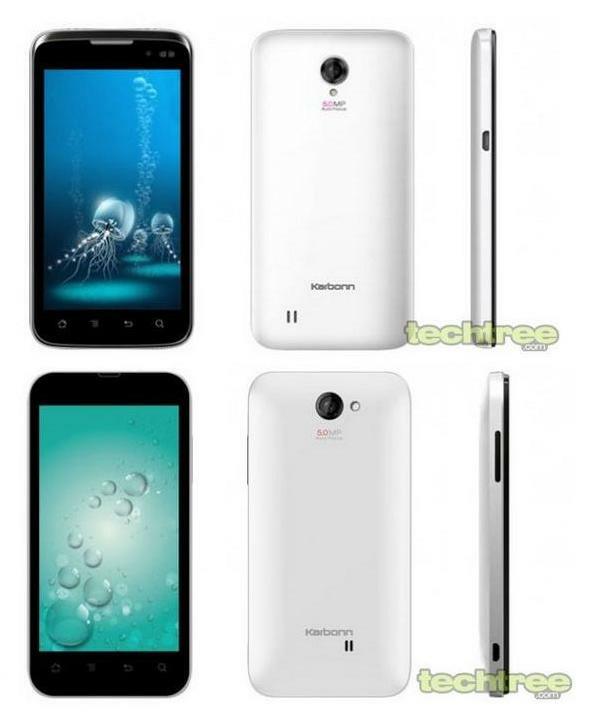 12000, and likewise the Karbonn A9+ is also available in Pearl White with a price tag of RS. 10000. However if you would like to grab one of these handsets for less, the Karbonn A21 can be picked up from Snapdeal for RS. 10490, or at Flipkart for RS. 10790, whilst the Karbonn A9+ can also be purchased for less from Flipkart at RS.8999. to bhai kya 10K mai 4Gb ram milegi?